In the years preceding the invasion of Russia, Charles had inflicted significant defeats on the Danish and Polish forces, and enthroned the puppet king Stanislas Leszczyński in Poland. Having consolidated his victories there, Charles turned his attentions to Russia. He entered Russia by crossing the frozen Vistula River at the head of 40,000 men, approximately half of them cavalry. This tactic was characteristic of his military style, which relied on moving armies with great speed over unexpected terrain. As a consequence of this rapid initiation of the campaign, Charles nearly gave battle with Peter the Great just one month into the campaign, reaching Hrodna, now in Belarus, a mere two hours after Russian forces had abandoned it. Charles was a skilled military leader, and probably considered the invasion to be a risky enterprise; he had resisted the advice of his generals to invade during the Russian winter following the first Battle of Narva (1700). He chose to continue his invasion now because he expected Swedish reinforcements and the alliance of the Cossacks under Ivan Mazepa. The reinforcing Swedish army, however, was ambushed by Russians, and a Russian army under Aleksandr Danilovich Menshikov had destroyed Mazepa's capital and chased him to Charles with just thirteen hundred men. The invasion was further complicated by the scorched earth strategy formulated by Peter and his generals. The Russian armies retreated continuously, dispersing the cattle and hiding the grain in the peasant towns they passed, burning unharvested crops, and leaving no resources for the Swedish army to stave off the Russian winter. By the end of the winter of 1708–1709, the "Great Frost of 1709" had devastated the Swedish army and shrunk it to 24,000 men. 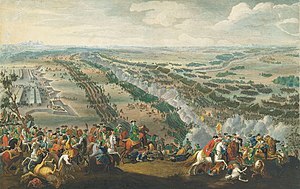 In May 1709, the Swedish forces caught up to the Russians, and the two armies clashed in the Battle of Poltava. The Swedish were defeated, and the greater part of Charles's army, some 19,000 men, were forced to surrender. Charles fled with his surviving 543 men to the protection of the Ottoman Turks to the south, who were traditionally hostile to Russia. Here, Charles was eventually able to persuade the Sultan Ahmed III to declare war on Russia. Backed by a Turkish army of 200,000 men, Charles led the Turks into the Russo-Turkish War (1710–1711). Before Charles could give battle, though, Peter was able to bribe the Turkish vizier to peace; with this, Charles's ambitions to invade Russia were ended. The consequences of the failed invasion were far-reaching. The Swedish Empire never added new territory after the Battle of Poltava, and shortly thereafter lost more possessions. George I of Great Britain led Great Britain and Prussia into war against Sweden, and Denmark reentered the war. Russia maintained its conquered possessions in Ingria and the Baltic, was able to consolidate its hold over Ukraine and Poland, develop the new city of Saint Petersburg, and gain vital trade links in the Baltic trade. Peter the Great also gained further prestige in Europe, and won Louis XIV as an ally. ^ 121,000 Russians of which 57,500 directly under Peter I stationed between Severia and Smolensk, 24,500 at Saint Petersburg under Fyodor Apraksin, 16,000 at Dorpat under Christian Felix Bauer, 12,000 at Kiev under Mikhail Mikhailovich Golitsyn and 11,000 at Moscow. Another 12,000 men were used to beat the Bulavin Rebellion, however these were only able to assist in the fight against the Swedes at the end of the campaign. 35,000–40,000 Cossacks by Ivan Mazepa and Konstantyn Hordijenkas and 10,000 Kalmyk troops by Ayuka Khan. 23,500 Poles under Adam Mikołaj Sieniawski in Poland. ^ 77,000 Swedes of which 33,000 directly under Charles XII at Grodno, 22,000 in Livonia, Ingria and Courland under Adam Ludwig Lewenhaupt, 14,000 in Finland under Georg Lybecker and 8,000 in Poland under Ernst Detlof von Krassow with about 20,000 Poles under Stanisław I. ^ a b Peter From, Katastrofen vid Poltava (2007), Lund, Historiska media. pp. 77. ^ Kuvaja, Christer (2008). Karolinska krigare 1660–1721 (in Swedish). Helsingfors: Schildts Förlags AB. p. 181. ISBN 978-951-50-1823-6. ^ Ullgren, Peter (2008). Det stora nordiska kriget 1700–1721 (in Swedish). Stockholm: Prisma. p. 169. ISBN 978-91-518-5107-5. ^ Englund, Peter (1988). Poltava (in Swedish). Stockholm: Atlantis. p. 38. ISBN 91-7486-834-9. ^ Cooper, Leonard (1968). Many Roads to Moscow: Three Historic Invasions. London: Hamish Hamilton. p. 42. ISBN 0-241-01574-X. ^ Peter From, Katastrofen vid Poltava (2007), Lund, Historiska media. pp. 174. ^ a b Clodfelter, Micheal (2002). Warfare and Armed Conflict. McFarland. pp. 94, 97. ^ Peter From, Katastrofen vid Poltava (2007), Lund, Historiska media. pp. 196. ^ Тарле Евгений Викторович Северная война и шведское нашествие на Россию. — Сочинения. — Москва: Издательство Академии Наук СССР, 1959. — Т. 10. — С. 363—800. — 841 с. ^ Moltusov, Valerij Aleksejevitj (2009). Poltava 1709: Vändpunkten (in Swedish). SMB. p. 83. ISBN 978-91-85789-75-7. ^ a b Peter From, Katastrofen vid Poltava (2007), Lund, Historiska media. pp. 240. ^ a b Moltusov, Valerij Aleksejevitj (2009). Poltava 1709: Vändpunkten (in Swedish). SMB. p. 93. ISBN 978-91-85789-75-7. ^ Peter Englund: Poltava, p.215. Atlantis 1988. ISBN 91-7486-834-9. ^ (in Swedish) Christer Kuvaja: Karolinska krigare 1660–1721, p.192. Schildts Förlags AB 2008. ISBN 978-951-50-1823-6.